Well, as I expected, I forgot some stuff. But I have still much more than you!!! And witchprincess,please do not act like that just because we have less stuff than you.What are you doing is called egoism and arrogace,that isn't very good,and actually not allowed to do on online forums.If you ever say that again,you will get banned. A1 poster?Isnt that the promo poster with the band on it? and with the release date 7th septemeber 2007? ^ You can order it at NuclearBlast.de! The Phantom Agony Bonus Track - Veniality. I would never pay more than €50 for an album or vinyl, but I think that's just me. I don't have a big collection. 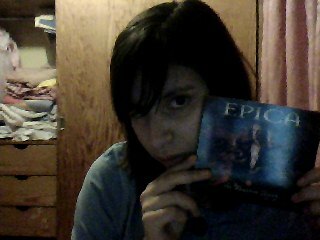 Shame on me, but for me having a big collection of Epica doesn't mean how much you love them, haha. But that's my opinion! My little collection, but I'm proud of it. Autographs by Sjaak, Mark & Arie on my Consign to Oblivion + DVD version. and new pics with Sjaakie and Mark.